Nurse Jackie hits rock bottom…are nurses cheering? Maybe what irritated us the most about last season’s Nurse Jackie was the lack of serious consequences she received as a result of her philandering, drug use, rudeness, haphazard parenting…the list goes one. 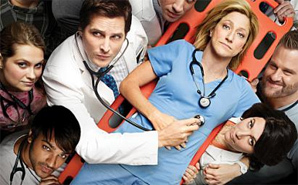 We were left wondering after Season Three: Where could Nurse Jackie possibly go when there’s nothing left to wreck? But our attitudes changed with the beginning of the Fourth Season, in which we see Edie Falco’s Jackie finally hit rock bottom and get into rehab. It’s about time (and kudos to Ms. Falco for keeping us mesmerized even as we were throwing our steths at the TV all through season three). We think it’s going to be a good season. Do you? See what TVFanatic.com says here. Is Season Four going to turn you back on to Nurse Jackie? No, I used to watch but I'm not interested anymore. No, I never watched and I never will.